Garbage can carrier mounts to a standard hitch tow receiver on your vehicle. 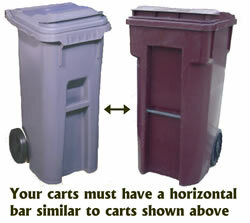 Lifts fully loaded trash, recycle or yard waste cart with ease. Complete mobility of vehicle movement. Drive forward or backup on steep or flat terrain. Carrier easily attaches and detaches from vehicle. Minimal effort required. Women and teenagers can easily raise or lower cart. Cart is suspended 9 to 10 inches above the roadway for easy transport. Virtually eliminates cart drag at steep roadway grade changes. Set desired height once. Increasing height does not require increasing loading and unloading effort or time. "For use on private roads or property, not intended for use on public roadways."